Star Blazers 2199, known in Japan as Space Battleship Yamato 2199 (宇宙戦艦ヤマト2199 Uchū Senkan Yamato Ni-ichi-kyū-kyū), is the 2012 reboot of the 1974 Japanese series Space Battleship Yamato. This sci-fi space opera follows the events following an interstellar war between Earth and an alien race known as Gamilas. The Gamilas, who make their home base on the planet Pluto, begin bombarding Earth with reformatted asteroids dubbed “planet bombs” in an effort to wipe out humanity and terraform the planet for their inhabitance. Earth, banding together under the United Nations Cosmo Navy fight back against the aliens, but they are ultimately overwhelmed by the aliens’ superior force and technology. One ray hope comes when Earth finds itself an interstellar ally that offers them an advanced technology, the Dimensional Wave Motion Engine that will help humans travel to interstellar space and the Cosmo Reverse System to aid in reversing the damage caused by the Gasmila’s planet bombs. But first, the Navy must retrieve the CRS, and for that they must build a new battleship with the Dimensional Wave Motion System. Picking up from the first half of the season, this part two collection, encompassing episodes 14-26, sees the Yamato heading off towards the edges of the Milky Way and heading off into deep space as they continue to try to save Earth. These episodes ramp up the intrigue and danger for the crew of the Yamato and the action we saw in the series’ first half, as Lord Desler is out to prevent humanity from arriving at Iscandar. I think the second set of episodes in this collection, for anyone who hasn’t already seen the series in its entirety, will only serve to confirm that Star Blazers 2199 AKA Space Battleship 2199 is a homerun. The series’ drama, action, level of quality animation, artwork, and character development is all the of the highest caliber, and it also reworks the original 1970s series in plausible, satisfying ways, making changes that broaden the scope of the series, while also maintaining a certain level of reverence to the original material. Star Blazers 2199 Part Two hits Blu-ray with the same satisfying 1.78:1 AVC 1080p high-definition encodement from Funimation. The digital animation ‘pops’ nicely and the 3DCG work looks strong, without much in the way of aliasing or stairstepping. The saturation is good, colorful without oversaturation, and I don’t see much color banding. 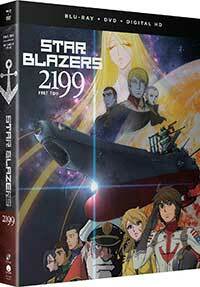 Star Blazers 2199 Part Two comes with the original Japanese-language mix in Dolby TrueHD 2.0 stereo. It’s a good mix and a fantastic performance from the cast. An English dub from Funimation is also included in a Dolby TrueHD 5.1 mix. The English cast and dub don’t impress me as much as the Japanese cast, but the sound quality of the mix is surprisingly good for Funimation, offering a good amount of balance and a fair amount of low-end and solid sound effects in the surround channels. There’s an excellent documentary on the new reboot included and an Episode 16 audio commentary, in addition to the usual promos, textless openings plus additional trailers. It’s a decent set of special features for fans to dive into. Part Two of Star Blazers 2199 on Blu-ray makes the case for this being one of the greatest anime reboots to come along in recent years. The material is strong, the animation is high level, and this Blu-ray offers up strong audio and video quality. This part two collection from Funimation of this of this awesome reboot of the 1970s anime space opera takes its crew to the edge of the Milky Away and on the verge of deep space. These episodes solidify the series as an A+ reboot of this classic rock opera and also offers solid sound and picture quality.